One of the many important things that Stan Nelson taught us at his 2016 Wells College punchcutting class was a working method that he had learned in his studies with Nelly Gable at l'Imprimerie nationale. The method doesn't really have a name; it seems to be known instead by the name of its distinctive feature: l'indication (the indication). It soon became apparent that this method was more than just another technique. As Stan said, it is a "game changer." If there is any single technique which is the key to success in punchcutting, this is it. That isn't to say you can't cut a punch without it - of course you can. But (again, in Stan's words) the technique of "l'indication" allows your work to be "consistent, systematic, and precise." The method of l'indication is discussed in Christian Paput's book "La Lettre" (1990, 1998), but I cannot recall seeing it elsewhere in the literature (either of punchcutting or of other work with the file and graver). 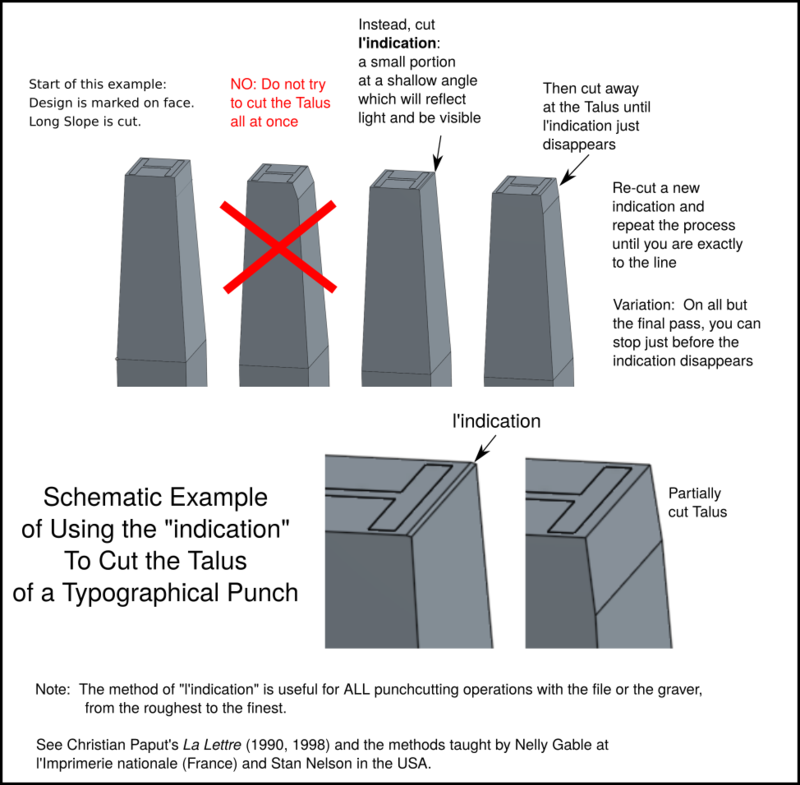 I'll try to describe it here in terms of one operation, cutting the "talus" on the punch. But the method is useful for ALL work with either the file or the graver, from the relatively rough work filing the hammer-end of the punch blank to the finest work with the graver inside a counter. So to start with here is a quick CAD model of a punch identifying some features (the talus, the long slope). "Talus," if online French dictionaries are to be trusted, simply means "slope" or "embankment." It is the portion of the punch which is responsible for the part of a type known in English as the "beard." It is translated as "beard" in the 1998 bilingual edition of La Lettre, but it is useful to have it as a distinct name for this feature as found on a punch. (The talus on a punch must be at least slightly longer than the beard on the type, because it must exceed the depth-of-drive of the matrix.) So talus it is. 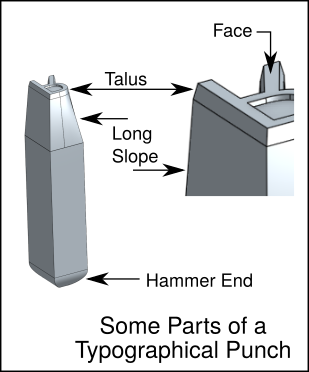 If you think about cutting the talus with files, the lower edge must be straight, at the same level all around the type, and generally have a neat appearance. The talus itself as cut at the I.N. is also straight in cross-section (this was not always the case historically). But the critical part is the top edge. It must come EXACTLY to the line. The precision required is quite high, measurable in ten-thousandths of an inch or hundredths of a millimeter (or fractions of a point). To accomplish this, you have to be looking at it really closely, under magnification, while you're cutting. But the problem is that while you're doing that it is hard also to see the rest of what you're cutting. The upshot of this is that trying to cut the talus all at once is very, very difficult. Even if you do it in successive stages (as you should, even using the method of l'indication), trying to cut all parts of the talus at the same time is hard. The solution is both very simple and drop-dead brilliant. Before starting to cut at the talus itself (which is at a pretty steep angle), instead cut away a very small sliver on edge of the face of the punch blank, and cut it at a shallow angle. Don't cut all the way to the line - work in stages. This small bit that you cut away is "l'indication" - the indication. The important thing about it is that it will reflect light differently from both the face of the punch blank and the talus (or whatever else) that you're filing. It will shine/glint in the light when the light is at the right angle. This means that you can see whether the indication is still there or not even without looking at it close-up under magnification. It gives you exactly what its name says it is - an indication of the state of your work in cutting. With l'indication, you can pay attention to the whole of the work you're doing and yet still not cut beyond your intended limit. Then repeat the process: cut a new indication, and then cut away at the talus until this new indication, in turn, disappears. Repeat until in the final iteration the indication comes right to your line and, in making it disappear, you file exactly to the line. Finally, my thanks (yet again!) to Stan Nelson for introducing us to this technique in class. Its use goes far beyond punchcutting - it's a general technique for all fine work with file or graver. Super appreciated contribution. I couldn't understand well l'indication method on Paput's book and now I get it. I will put it in practice on the next punch. On the course we attended (myself & Patrick Goossens) at the Imprimerie National, the most important thing when cutting the punch was the l'indication, so the big file was used to rough out the punch until we were close to the image, then here the indication starts, so the slope is different to the normal and is steeper, so when the indication is made, then you can then file happily away until you are near the indication and when you are looking through the loupe you will see what looks like a silver thread, when you are here you stop, as you have filed to the indication and need to start making a new one, you do this until you are getting close to the image, you have be careful when getting close to the edge of the image as it is here that you will make your final cut, which is nearly the same as the indication but approximately 45 degrees, now here I made a mistake, and filed this away on part of my punch so one piece was without this slope, now I was told by Nelly that this method of not having the second slope was used some time ago, but only in the last century did the Imprimere National start using the second slope, and it was how she and Paput had been taught. I hope this makes some sense.